Last year, ninth grade student Talia Weisberg was inspired by the strength and courage of Jewish partisan Sara Fortis and many other Jewish women who came before her. Read her moving essay below. JPEF will be announcing its 2011 Writing Contest soon! E-mail writingcontest@jewishpartisans.org for more information. I am with Sarai as she becomes Sarah. I assist Rebecca as she helps Eliezer water his camels. I stand behind the chuppah with Rachel as Jacob unknowingly marries Leah. I strum a harp with Serakh as she tells Jacob that Joseph is alive. I sing with Miriam as she leads the Jewish women through the Red Sea. I protest with the daughters of Zelophehad as they ask Moses for their inheritance. I sit with Deborah under her date tree as she judges the Jewish people. I hand Jael the tent peg to kill Sisera and save her nation. I pray with Hannah in the Temple as she beseeches God for a child. I fast with Esther as she prepares to approach Ahasuerus and try to save her people. I go from the plains of the Fertile Crescent, the deserts of Egypt, the lush fields of Israel, and the palaces of Persia to a more recent time. I am witnessing a hell unlike any I have seen before. Women, skeletons, starve in concentration camps I can barely recognize my grandmother and great-grandmother with several other female relatives, shipped from a wealthy home in Hungary, to this cold Polish prison, Auschwitz. I help my cousin pull my great-aunt from the left line, and again from a wagon destined for certain death I shield my great-grandmother as she steals scraps of food from the kitchens and trades them for cigarettes for my grandmother to smoke I deny the non-kosher meat with my great-grandmother and live off of air I feel the starvation, the cold, the pain, with my Jewish sisters. As soon as I have seen their nightmarish life conditions in the concentration camp, I find myself among a group of Partisans, girls turned into women prematurely, acting as men trained for battle. They are dressed like regular Greek villagers, but it’s obvious they are on a mission. They stop at a house with swastikas on flags outside of it, and start a fire inside. “Captain Sarika!” one girl calls out. “Sarika Fortis! Have we done it right?” Smoke begins to curl out of the house’s windows. “Yes, Eleni,” the captain replies. “Now we must go! The Partisans must never be caught!” The women hurry from the scene and I run with them, marveling at their strength, their audacity, how such young women could stand up to tyranny and prejudice with no second thoughts. “We are of the Line,” my mother says, talking about the strong line of women we descend from, and yes, all I can do is nod, all I can do is agree. All these women were strong, defying social norms, protesting prejudices that kept them down, always questioning authority, never taking no as an answer, always fighting, always working, always reaching their goal. Michele Tyler, 7th grade Language Arts teacher at Clark Middle School in Saint John, Indiana, attended an educator institute in Lafayette, Indiana. Integrating the lessons that she learned into her classroom, Tyler developed a project allowing each student to choose one Jewish partisan to learn about. “They each created a quilt square to represent their partisan, and then we sewed the squares together.” When teaching about the Holocaust to her class the central theme for Tyler is to explore the issue of “am I an upstander or a bystander?” Her class examines this concept by reading Children of Willesden Lane and the stories of the partisans to support her central theme. The second week of my journey in South Africa took me to Durban and Johannesburg. While in Durban, I spoke at the International UN Holocaust program to a sold out audience at their Holocaust Centre. Part of this program was the local premiere of the play “The Boys from the Ashes.” Written by his granddaughter, Courtneigh Cloud, “The Boys from the Ashes” is a powerful play about Israel Gurwicz, a Holocaust survivor from Vilna who was involved with Abba Kovner and his ghetto resistance. Mary Kluck, Durban Holocaust Centre Director during opening remarks. The following day I addressed a group of docents -- preparing them for our Faye Schulman exhibit that will be in Durban in early March. I also conducted a teacher training consisting of educators who teach in both private and state schools. After the workshop, one educator wrote, "The workshop answered some stereotypes one had about the Jewish community." The idea of Jewish passivity during the Holocaust is so pervasive even among educators, and I was glad I could dispel it through the JPEF training. 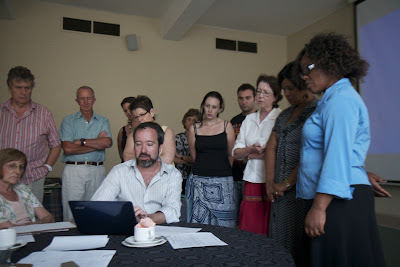 JPEF Executive Director Mitch Braff goes over the JPEF website with local educators in Durban. 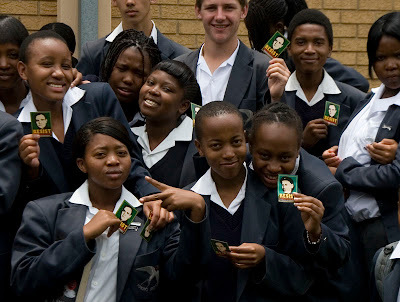 I learned a great deal on the challenges of teaching in South Africa. Primarily, that in many parts of South Africa, at least outside of the big cities, many schools are without electricity. More importantly though, many educators in the townships do not know what the Holocaust was and for that matter how to teach the lessons. I admire the work and staff of the South African Holocaust Foundation, for they are teaching in a challenging environment, to say the least. They are also doing excellent work on talking about the Holocaust in context with the Rwandan genocide. It was a privilege to be part of all three of the Centre’s incredible and meaningful work. JPEF presentation at King David High School in Johannesburg. 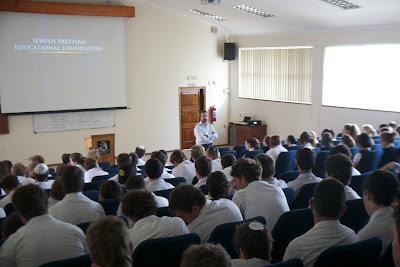 The first day in Johannesburg, I was invited to speak at the Great Park Synagogue as part of a community-wide program. I also presented at both the King David and Wendywood schools in the Joburg suburbs. The contrasts between these high schools were significant. Kind David is a private Jewish school on a beautiful campus with amazing facilities, whereas Wendywood is a state school in a nice Joburg suburb, with many students from the neighboring townships attending. This is quite similar to urban public schools in the US vs. private schools in the same city. King David was all white, and Wendywood was nearly all black. Both groups of students enthusiastically embraced the subject matter. In fact, the head teacher from King David promised that his students will learn the partisan song and send us a video when they do. Eta Wrobel (z"l) and Zus Bielski (z"l). Our Resist stickers were big hits with both groups of students--though the Wendywood kids were definitely a bit more enthusiastic. By the time I left South Africa I had spoken to over 1,000 people, including 80 educators in Cape Town, Joburg, and Durban. Our exhibit will be seen by thousands of people, including schools making special trips to view the compelling photographs and learn about Faye’s experience. The local Jewish paper ran an article on my visit and a Joburg radio station even interviewed me about the trip. It is our hope that history and life lessons of the Jewish partisans will be taught in classrooms for years in South Africa, but there are still thousands of educators that we still need to reach. 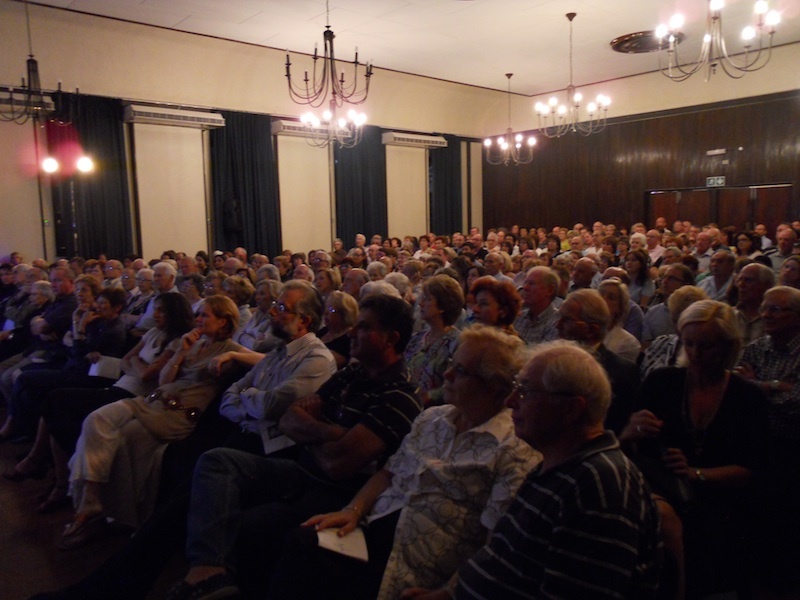 JPEF presented to a full house at the Durban Holocaust Centre. I know that we have made a significant impact in South Africa. 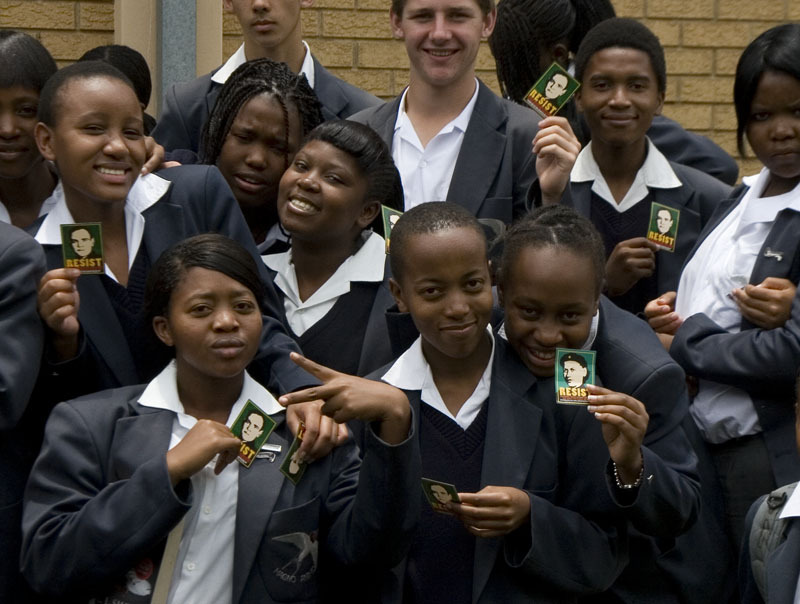 In the coming months and years, JPEF looks forward to continuing to build its relationship with the South African Holocaust Foundation and to bring our materials and programs to communities throughout South Africa. Here is an article that features Mitch Braff during the U.N.'s Holocaust Remembrance Day from their website. Mitch Braff (center) with Janine Cohen (left) and Tali Nates (right) from the Johannesburg Holocaust and Genocide Centre. Tali is the Executive Director and an international leader in Holocaust education. Every self-published author thinks he or she has something important to say. It’s rare that the reader agrees, I’m afraid, and rarer still when history or literature is enriched by the author’s effort. Like other survivors of the Holocaust, Andrew Stevens managed to find a safe refuge in America after the war. The Beverly Hills businessman, whose name back in Hungary was Steinberger Endre — the family name was given first in Hungarian usage — has been active in Jewish philanthropies, including the sponsorship of monuments to the victims of Nazi genocide, but he has remained mostly silent about his own exploits until now. With the publication of “Rebel With a Cause,” Stevens is finally telling his own remarkable tale of resistance against Nazi Germany and its Hungarian collaborators. The ordeal of Hungarian Jewry is especially heartbreaking because it came at a time when reports of what was happening in the death camps and the killing fields had already reached the West. “During the first years of World War II, we lived in a fool’s paradise in Budapest,” he recalls. “We were buying time and ignored the time bomb ticking in our ears.” Only in 1944 did the Nazis finally turn their deadly attentions to Hungary. 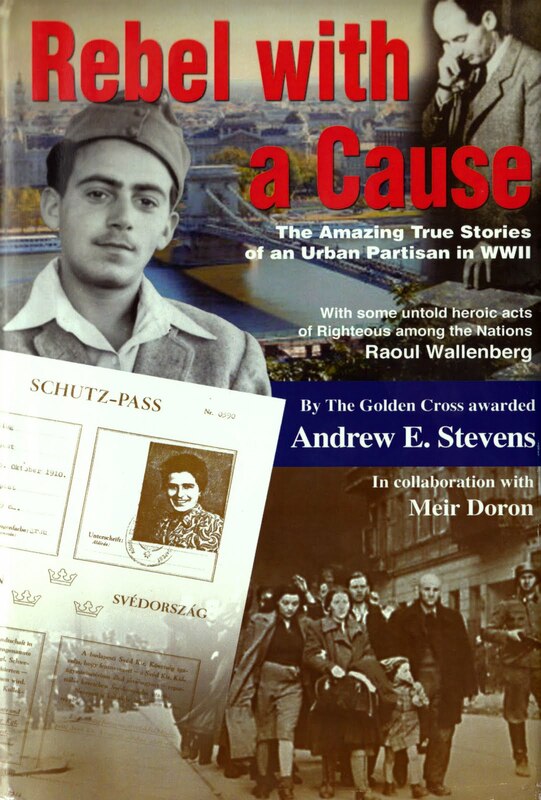 Stevens tells his tale in a parallel narrative consisting of recollections of his return visit to Hungary long after the war and flashbacks to the terrible times when he was “a fugitive in [his] own city,” struggling to avoid the fate that befell so many of his fellow Jews and surviving on physical courage and sheer chutzpah. He managed to escape from the labor battalion in which he was forced to serve, tore off the yellow stripe that identified him as a Jew and searched out the Zionist underground that was finding a way out of Hungary for a precious remnant of the Jewish community. Stevens adopted a new identity as a Christian — he donned an eye patch and a bloodstained bandage in order to feign battle injuries as a “wounded war hero” — and undertook a new job as a forger and smuggler of documents. 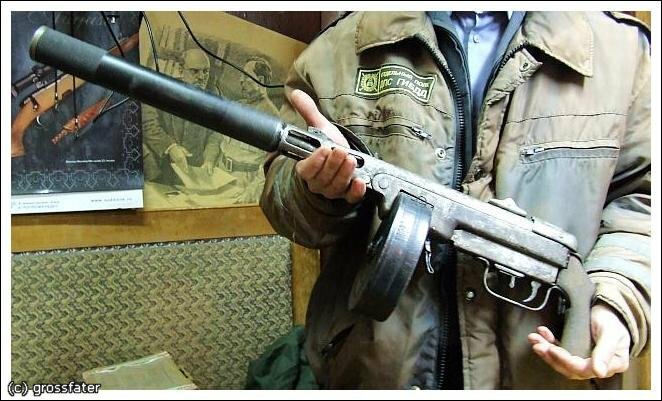 “Each of these documents can save the life of yet another Jew!” he was told by his comrades. Some of these forgeries are reproduced in the book along with photographs of the handsome young man who created them — an archive of documentary evidence and, at the same time, a thrilling war story, full of intrigue and suspense, including a daring escape under fire from the Hungarian fascists who aided the German army of occupation in finding and killing Jews. Stevens’ testimony includes firsthand glimpses of some famous historical figures, including Hannah Senesh and Raoul Wallenberg. 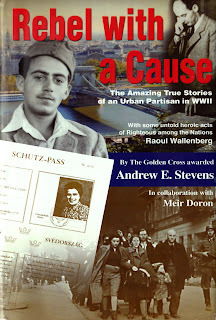 When Stevens asked why he had been chosen to carry documents from the forgery workshops to Wallenberg, he was told: “You and him, both of you are fearless.” Yet Stevens confesses that he is still haunted by memories of the atrocities that he witnessed while making his way through the streets of occupied Budapest, and he has not yet found an answer to his agonized question about the apparent passivity of so many victims of the Holocaust. The book that Andrew Stevens has written and published can be approached as an intimate family memoir, as the eyewitness testimony of a Jewish partisan, and as the courageous act of a man who has chosen to confront his own demons. For all of these reasons, “Rebel With a Cause” is one self-published book whose author has earned the right to put his own words into print. Copies of “Rebel With a Cause” by Andrew E. Stevens in an e-book edition can be ordered from Amazon.com at $9.99 per copy. Hardcover copies can be ordered directly from the author through the following e-mail address: rebelwithacause.as@gmail.com. Jonathan Kirsch, author and publishing attorney, is the book editor of The Jewish Journal. He blogs on books at www.jewishjournal.com/twelvetwelve and can be reached at books@jewishjournal.com.